This breathtaking new image of the Orion Nebula offers astronomers an intimate view of a vast stellar nursery, and helps researchers better understand the phases of star birth and evolution. The ethereal glow of the nebula was captured using the Wide Field Imager on the MPG/ESO 2.2-meter telescope at the La Silla Observatory in Chile. The telescope is part of the European Southern Observatory, which unveiled the new Orion Nebula image this week. 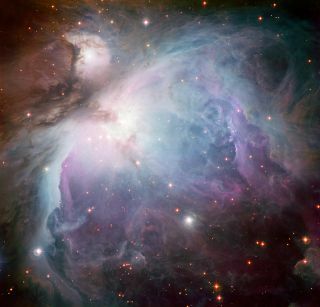 The Orion Nebula, also known as Messier 42, is one of the most well-studied and easily recognizable celestial objects. The massive star-forming region, swirling with gas and dust, is located about 1,350 light-years from Earth. The glowing gas is so bright that it can be seen with the unaided eye, and is a fascinating sight when viewed through a telescope. Yet, despite its familiarity and relative proximity to Earth, there is still much to learn about the stellar nursery. For instance, it was only in 2007 that the nebula was found to be about 150 light-years closer to our planet than was previously thought. The observations used for this image were selected by Igor Chekalin from Russia, who participated in ESO's Hidden Treasures 2010 astrophotography competitionfrom October to November 2010. The contest gave amateur astronomers the opportunity to search through ESO’s vast archives of astronomical data, hoping to find hidden gems amongst the extensive records to make beautiful images of the night sky using real astronomical data. Chekalin identified datasets that he used to compose this image of Messier 42, which was the seventh highest ranked entry in the competition, out of nearly 100 entries. So, data that had been originally been collected for a ESO science project, with no intention of being made into a color image, have now been reused to create this stunning and richly detailed picture of the Orion Nebula.